You are knee-deep in a recipe when you realize the butter measurement is in grams—but the wrapper around the butter only shows teaspoons, tablespoons, and cups. You don't own a food scale, so what do you do? Since grams are a weight measurement and U.S. tablespoons are a volume measurement, there isn't a universal conversion chart. Different ingredients weigh different amounts. Butter weighs more than flour, for example, so 14 grams of butter is going to be 1 tablespoon whereas 14 grams of flour is a little more than 1 3/4 tablespoons. This quick guide converts grams of butter to tablespoons, and vice versa. 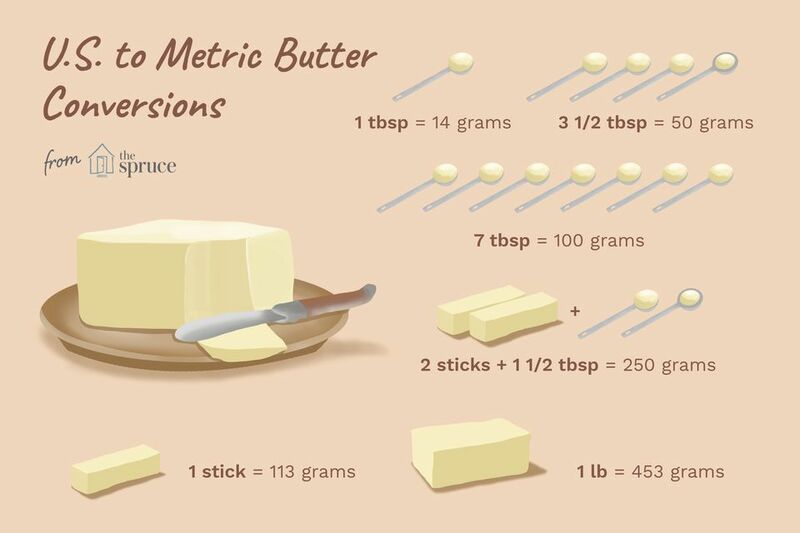 Keep in mind that this specific conversion chart only works for butter. The decimals have been rounded to the nearest whole number. You may have noticed that many American recipes list butter measurements in the ingredient lists in a few different ways. It can be in tablespoons, but very likely can also be in cups, sticks, ounces, and pounds. Instead of calculating a multiple conversion, this chart spells it all out for you. Since most sticks of butter come with measurements printed on the outside of the wrapper, it should be somewhat simple to decipher how much you need. One stick of butter is marked by teaspoons and tablespoons, and also shows the tablespoon-to-cup equivalents. The front of the wrapper also reads 4 oz. and 113g net wt. If you are using softened butter, however, you will not have these guides. To measure softened butter, scoop and press it into a measuring spoon or dry measuring cup, pushing down with a spatula to remove any air. Then level the top with the spatula or the flat side of a knife. Maybe you have stick butter but only leftover, odd-shaped pieces. Not to worry—there is a simple method you can use to measure out the amount you need. Take a two-cup liquid measuring cup and fill up to the one-cup mark with water. Then begin submerging the butter pieces, poking them down if needed, until the water level reaches the amount of butter required in your recipe. For example, if you need 1/4 cup (4 tablespoons) butter, add butter pieces until the water level is up to 1 1/4 cups. Drain out the water and you are left with the amount of butter you need. If you remember that 1 tablespoon of butter is 14 grams, then you will be able to calculate almost any butter measurement, knowing that 4 tablespoons equal 1/4 cup and 3 teaspoons equal 1 tablespoon. If you find yourself cooking recipes where the same ingredients need to be converted over and over again, then it may be worth it to memorize a few other ingredient equivalents so you are not searching for conversion charts (because these conversions only work for butter—you can't use them universally). Just remember that the only metric measurements that can be converted to U.S. customary measurements are those that fall into the categories of temperature, length, volume, and pressure.